Unidesk is a Windows desktop and session host management solution designed for on-premise private clouds and public clouds. Unidesk’s underlying technology is “layering” – (file system and registry virtualization patented as Unidesk Composite Virtualization®) that enables all components of a virtual machine – Windows OS, applications, and user or machine personalization – to be independently assigned, patched, and updated. Build around this core innovation is a complete management system that encompasses everything from virtual machine provisioning and virtual hardware configuration to application management and desktop/server repair. The primary goal of Unidesk is to create a simple, easy to manage, end user computing environment that enables anyone in IT to manage Windows desktops and applications with one interface and one seamlessly integrated technology, regardless of their underlying hypervisor or cloud infrastructure. Unidesk makes IT more efficient by reducing packaging and delivery times for all applications to minutes; reducing the many Windows gold images that need to be patched in most environments to a single OS layer that only needs to be patched once; and enabling helpdesk staff and junior IT administrators to take on everything from application packaging and updating to desktop provisioning and repair, freeing up senior IT staff for more strategic projects. Unidesk layering enables IT to deliver applications that look, act and feel as if they are installed locally in the VM/Gold Image, but these application are actually stored in isolated virtual disks. With Unidesk, any application can be separated from the Windows OS. As a result, IT will only have a single OS layer to manage regardless of the number of machine configurations (pools, silos, delivery groups). This simplifies the environment while reducing management time/complexity and the costs associated with desktop and app management. The Windows OS and applications (or groups of applications) are stored as their own virtual disks (VHDXs or VMDKs) and contain only the files system objects and registry entries for that specific layer. By separating the applications from the operating system (and separating the personalization/unique changes for the machine from the operating system) you create a model where IT has one copy of any given OS or application, regardless of the number of desktop or session host configurations. Virtual Machines built by Unidesk will have several Read-Only virtual disks attached. At a minimum they will have an OS layer and Application layers assigned. Finally each machine receives a unique “personalization layer”. This personalization Page 6 of 40 layer will contain unique information for that VM that will include things like the Machine SID, computer name, local profiles, and even user-installed apps. When this model is applied to VDI, IT gains the management and storage benefits of a pooled or shared desktop model, but users receive a desktop that acts and performs like a full-clone, persistent desktop. Unidesk is Microsoft’s partner for bringing application mobility to Windows customers. By extending the native capabilities of Windows Server 2012 R2 and Azure, we make Microsoft VDI more scalable, easier to manage, and suitable for all use cases. Microsoft Approved & Certified Azure Ready. Unidesk is Microsoft’s partner for bringing application mobility to Windows customers. By extending the native capabilities of Windows Server 2012 R2 and Azure, we make Microsoft VDI more scalable, easier to manage, and suitable for all use cases. nidesk leverages Azure technology to make the delivery of remote applications to any device easy, efficient, and cost-effective. Simple Windows app deployment, upgrade, patching, and retirement. 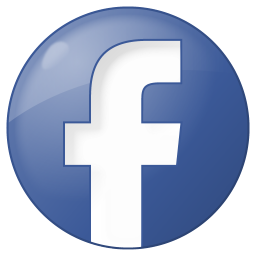 Best-in-class application layering and image management capabilities. Microsoft has chosen Unidesk as its application delivery and image management partner for Microsoft VDI and Azure. Unidesk accelerates Azure software deployment, upgrades, patching, and retirement by packaging Windows desktop applications as virtualized "layers." The same layers can be used for any number of RemoteApp images and RDSH servers for the ultimate in deploy-once, patch-once efficiency. Layered apps run on Azure and are accessed by end users through any computing device as though locally installed. Citrix XenApp – Unidesk reduces costs by eliminating inefficient XenApp silo management, multiple gold images, and application virtualization issues. Unidesk minimizes downtime by enabling you to update mission-critical apps without rebooting your XenApp session hosts. Simple XenApp Farm Management. Provision custom XenApp servers in minutes, deliver apps to silos without installation, patch Windows once for entire farms, and put an end to XenApp upgrade pain once and for all. Citrix XenDesktop – Unidesk accelerates virtual desktop deployments by enabling you to deliver any Windows app to any set of desktops without installation or app virtualization complexity. Unidesk reduces costs by enabling your entire VDI environment to be built on a single gold OS layer. 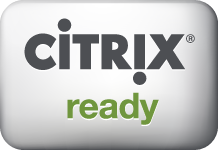 Citrix XenApp is the leading solution for publishing Windows desktops and applications. Unlike VDI, where every user has their own virtual desktop, XenApp shares a single desktop or application instance among many users. Desktop and apps running on XenApp servers can be remotely accessed from any endpoint device. The popularity of XenApp and the growth of XenApp server farms have created application delivery and image management challenges for IT, however. If all apps are installed on every server for uniformity and interoperability, the duplicate “images” create extra work for the administrators who need to keep Windows and apps up to date. If “silos” are created with fewer apps on each server, or if application virtualization is used to isolate applications in separate containers, apps can no longer interoperate and duplicate copies of Windows must still be patched. Time-consuming server rebuilds and application re-installations are also required to upgrade Citrix XenApp from one version to the next. Unidesk overcomes these challenges by virtualizing the Windows operating system and applications as read-only virtual disks, or “layers.” IT administrators can use Unidesk to provision XenApp servers simply by selecting a Windows OS layer and any combination of app layers. Unidesk composites the layers into logical C: drives for each server, enabling new applications, application updates and Windows patches to be delivered to an entire XenApp farm or specific XenApp silos without ever being installed. Unlike traditional application virtualization, layering is fast and easy, works for all apps and Windows itself, and delivers apps as if they were locally installed – not isolated – for full interoperability. XenApp upgrades that traditionally take weeks now only take a few minutes, leveraging Unidesk’s ability to deliver the Citrix Virtual Delivery Agent (VDA) as a layer to an entire XenApp farm, keeping all other server configurations and applications intact. Layering - The Best WAy to Deliver Apps. Imageless Management - Patch-Once Simplicity. Provisioning - Custom for Any Cloud. XenApp Upgrades - Fast and Future-Proof. 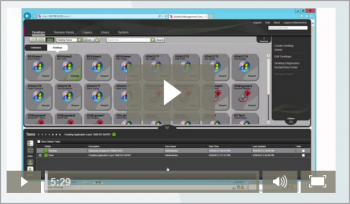 Unidesk provides the virtual desktop and application management capabilities that VMware customers need to simplify and scale VDI deployments with VMware Horizon. As a VMware Elite Technology Alliance Partner, Unidesk is fully committed to reducing VDI complexity so that more VMware End User Computing (EUC) customers can enjoy the benefits of desktop virtualization. Less Complexity. Lower Cost : Complexity is one of the biggest barriers to VDI success. Unidesk replaces the multiple tools traditionally needed to manage desktops and applications in VMware Horizon environments with a single, best-in-class solution that is far easier to use. If you want your desktop people managing VDI or time back for other IT projects, you need Unidesk. Overcome the App Delivery "Bottleneck" : VMware ThinApp is useful for virtualizing applications as isolated, self-contained files. However, apps that depend upon specific Windows OS features, registry entries and file locations cannot be delivered in this way. Limited interoperability between isolated applications and the time and expertise required by this approach are also problematic. VMware App Volumes is useful for delivering apps in real-time to running VMs as read-only volumes. But its "virtualize above the OS" approach introduces many of the same limitations as ThinApp. Apps with Windows dependencies and apps that need to stay running when users are logged out cannot be delivered. AppStacks - artificial groupings of apps - are needed to workaround limits of how many volumes can be attached to a VM. Apps that need to interoperate must be packaged in the same AppStack, adding packaging and patching complexity. Imageless Management : Unidesk is the only solution that can deliver the Windows OS as a "layer" - a read-only virtual disk that can be assigned to any number of VMs. Our unique ability to "virtualize above the hypervisor" eliminates images - VMs are simply collections of modular OS and App layers. No more creating or patching multiple VM templates with apps built-in. No more updating the same apps in multiple AppStacks. Just one instance of your layers to manage, no matter how many different Horizon View pools, VM settings, and application combinations you have. Patching Windows, staying in compliance with the latest Microsoft hot fixes, auditing changes, and undoing patching mistakes doesn’t get any easier. Persistent or Non-Persistent? Yes! : VMware Linked Clones and View Composer can reduce disk space requirements to make VDI implementations more affordable. However, the non-persistent desktops created by these tools do not retain user customizations. Persistent desktops that preserve personalization are what end users really want. Provision non-persistent AND persistent desktops with Unidesk – layering makes both space-efficient. In either case, the OS and application layers are stored once as read-only virtual disks and shared by many VMs. 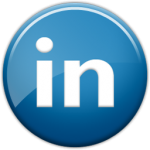 The only difference is whether the Unidesk Personalization layer is erased after each use. Your users will love customizing their persistent desktops with preferred settings, user-installed apps and plug-ins. Your IT team will love one set of layers to manage, the minimal space requirements, the quick and easy break/fix, and the end of profile management headaches. 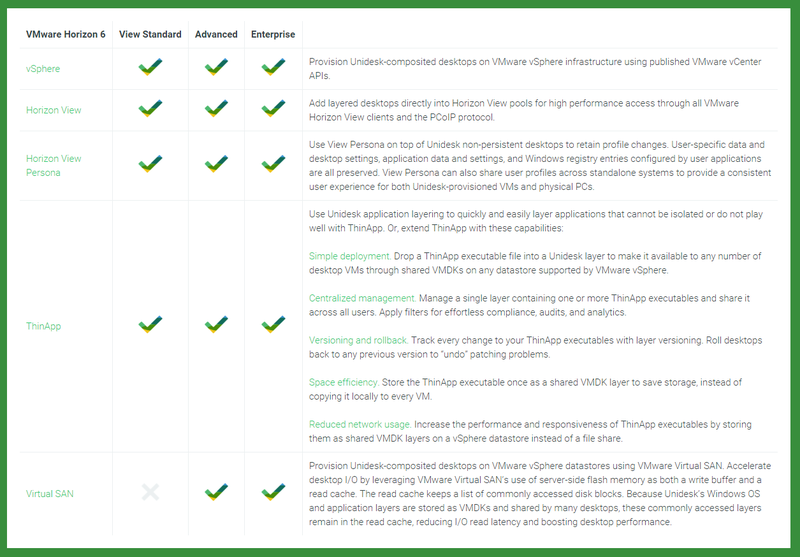 VMware Horizon 6 Compatible : No matter which edition of VMware Horizon 6 you choose – View Standard, Advanced, or Enterprise – Unidesk is fully compatible.